Image: an artist's conception of what life could look like on the surface of a distant planet. June 25, 2018: In the last decade, we have discovered thousands of planets outside our solar system and have learned that rocky, temperate worlds are numerous in our galaxy. The next step will involve asking even bigger questions. Could some of these planets host life? And if so, will we be able to recognize life elsewhere if we see it? A group of leading researchers in astronomy, biology and geology has come together under NASA's Nexus for Exoplanet System Science, or NExSS, to take stock of our knowledge in the search for life on distant planets and to lay the groundwork for moving the related sciences forward. "We're moving from theorizing about life elsewhere in our galaxy to a robust science that will eventually give us the answer we seek to that profound question: Are we alone?" said Martin Still, an exoplanet scientist at NASA Headquarters, Washington. In a set of five review papers published last week in the scientific journal Astrobiology, NExSS scientists took an inventory of the most promising signs of life, called biosignatures. The paper authors include four scientists from NASA's Jet Propulsion Laboratory in Pasadena, California. They considered how to interpret the presence of biosignatures, should we detect them on distant worlds. A primary concern is ensuring the science is strong enough to distinguish a living world from a barren planet masquerading as one. The assessment comes as a new generation of space and ground-based telescopes are in development. NASA's James Webb Space Telescope will characterize the atmospheres of some of the first small, rocky planets. There are plans for other observatories—such as the Giant Magellan Telescope and the Extremely Large Telescope, both in Chile—to carry sophisticated instruments capable of detecting the first biosignatures on faraway worlds. Since we won't be able to visit distant planets and collect samples anytime soon, the light that a telescope observes will be all we have in the search for life outside our solar system. Telescopes can examine the light reflecting off a distant world to show us the kinds of gases in the atmosphere and their "seasonal" variations, as well as colors like green that could indicate life. These kinds of biosignatures can all be seen on our fertile Earth from space, but the new worlds we examine will differ significantly. For example, many of the promising planets we have found are around cooler stars, which emit light in the infrared spectrum, unlike our sun's high emissions of visible-light. "What does a living planet look like?" said Mary Parenteau, an astrobiologist and microbiologist at NASA's Ames Research Center in Silicon Valley and a co-author. "We have to be open to the possibility that life may arise in many contexts in a galaxy with so many diverse worlds—perhaps with purple-colored life instead of the familiar green-dominated life forms on Earth, for example. That's why we are considering a broad range of biosignatures." The scientists assert that oxygen—the gas produced by photosynthetic organisms on Earth—remains the most promising biosignature of life elsewhere, but it is not foolproof. Abiotic processes on a planet could also generate oxygen. Conversely, a planet lacking detectable levels of oxygen could still be alive - which was exactly the case of Earth before the global accumulation of oxygen in the atmosphere. "On early Earth, we wouldn't be able to see oxygen, despite abundant life," said Victoria Meadows, an astronomer at the University of Washington in Seattle and lead author of one of the papers. "Oxygen teaches us that seeing, or not seeing, a single biosignature is insufficient evidence for or against life—overall context matters." The NExSS scientists will create a framework that can quantify how likely it is that a planet has life, based on all the available evidence. With the observation of many planets, scientists may begin to more broadly classify the "living worlds" that show common characteristics of life, versus the "non-living worlds." 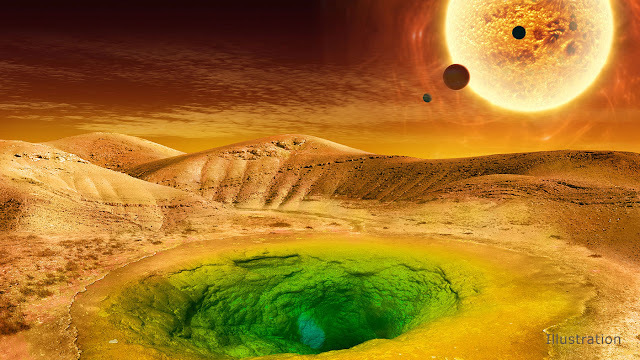 "We won't have a 'yes' or 'no' answer to finding life elsewhere," said Shawn Domagal-Goldman, an astrobiologist at NASA's Goddard Space Flight Center in Greenbelt, Maryland, and a co-author. "What we will have is a high level of confidence that a planet appears alive for reasons that can only be explained by the presence of life."